Don’t only use vinegar for cooking, they’re an eco-friendly alternative to cleaning. White distilled vinegar is the ultimate, all-purpose cleaning item that’s probably sitting in your pantry waiting to be used for other things. There are hundreds of household items and ways to use vinegar as a natural alternative rather than harsh chemical cleaners that do more harm than its purpose. 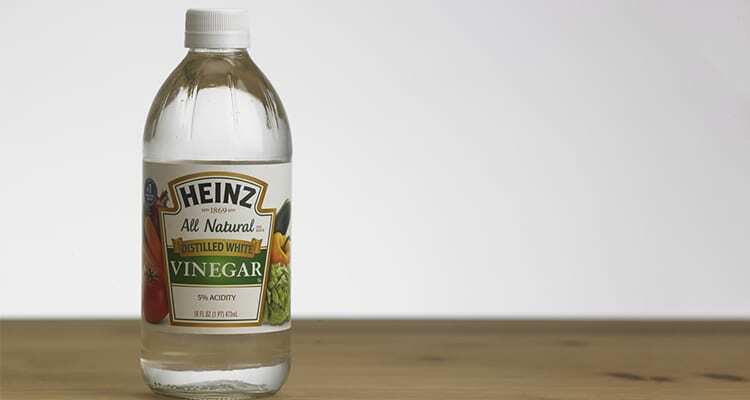 From de-wrinkling clothing and removing sticky residue from stickers to a hair rinser and keeping flowers fresh, give vinegar a try to help around the house. Vinegar should be your household staple when it comes to cleaning your carpets and flooring. Because vinegar is so acidic, they can remove stubborn stains including wine. Vinegar removes pet urine and its odor like a breeze. In addition, the acidity of vinegar keeps pets away from areas they shouldn’t be “doing business” in. Vinegar is great for all carpet types, synthetic flooring, tiles, and vinyl. Keep vinegar use away from natural stone flooring like marble and granite, as well as authentic hardwood. Fill up a microwave-safe bowl with a cup of white distilled vinegar and a cup of water. Feel free to add any natural scent enhancers like lemon, lime or orange if you’re sensitive to the smell of vinegar. Heat the bowl in the microwave for 5-10 minutes (depending on the dirtiness of the microwave) and let it sit for a minute or two. Remove the bowl and begin wiping down the inside of the microwave with a damp sponge, rag, or paper towel. You’ll be surprised how easy the gunk will come off! Remove mold, mildew, odors, and other dirty grime in your showers, bathtubs, and toilets. Feel free to mix in baking soda for extra tough messes and add citrus juice or essential oils for smell sensitivity. You could even wipe down mirrors with 50/50 vinegar and water mixed in a spray bottle and wipe down with a rag or cloth. Vinegar absorbs unwanted odors in everything you can imagine. Noticing a room that reeks? Leave a bowl of white distilled vinegar to sit for a couple hours and notice the stench will disappear. You could even soak vinegar in extra-smelly and sweaty clothes. In addition, wash smelly water bottles and any containers with any displeasing odors and it’ll be fresh before you know it. Pour a generous amount of vinegar down your drains every three months to keep clogs from forming. If you already have a clogged drain, mix a cup of white distilled vinegar, a cup of boiling water down the drain, and baking soda and pour down the drain. Let it sit for a few minutes and follow once more with a pot of boiling water. Goodbye clogged drains! Does your kitchen have any burnt or grubby pots? Solve the problem with vinegar! Soak your pots and pans in hot to boiling water, add baking soda and fresh lemon juice (for an extra clean), and get scrubbing. You could even use this process for the filth in your oven!